Until relatively recently, if you needed someone to conduct a funeral and had no particular church connections, the funeral director (FD) would provide the name of a local vicar. However, there are now other options available. Bob Bury, a Humanist funeral celebrant, tells us more about humanist funerals. “When I retired, I trained as a funeral celebrant with Humanists UK, and stepping in to help families at a very testing and emotional time has proved to be a challenging and rewarding experience. What follows relates to humanist ceremonies, but there are other non-religious celebrants available (indeed, anyone can conduct a funeral if they so wish). With an accredited humanist celebrant you have the reassurance that they have received the appropriate training, and undertake regular continuing professional development and assessment. Having decided that you want a non-religious service, what should you do? Well, many FDs will have a list of celebrants you could contact. Alternatively, you could go to the Humanist UK website at, click the ‘ceremonies’ tab and choose ‘find a celebrant’ from the drop-down menu. You then choose the sort of service you want (we also conduct weddings and namings) and you’ll be able to put your postcode in, and find a celebrant near you. That site will also answer any questions you might have about humanism as a way of life. If you aren’t sure what you want, we will always be happy to talk to you about the options with no commitment on your part – this is an important element of the service we offer, and it’s free! If you do decide on a humanist funeral, the celebrant will arrange to come and meet with as many relatives and friends as you think necessary, usually in your home. This allows us to plan the sort of ceremony you want, and you have complete freedom to choose what to include – I recently conducted a ceremony for a life-long trade unionist, and we all stood up and sang The Red Flag! Although most funerals now involve cremation, we still carry out burials, and a woodland site is an increasingly popular option. Family members or friends may wish to contribute to the service, but others will just want the celebrant to perform all aspects of the service for them. 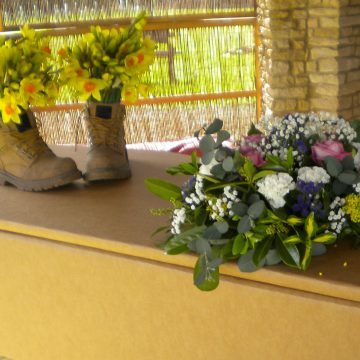 We use the family meeting to find out all about the deceased, so that we can construct a ceremony that will meet your wishes, and we can also answer any queries you have about the mechanics of the service – for example, how long it can last, and the procedure for entering and leaving the funeral venue. Although funerals are clearly sad occasions, a humanist ceremony is designed to be a celebration of a unique life lived, rather than a dark and mournful meditation on death, and it will be structured to reflect that very individual nature of the deceased, including their hobbies (see photo) rather than being a one-size-fits-all response to their death. That’s how it works when we are called in following a death, but increasingly, we are invited to meet with people usually, but not necessarily, suffering from a terminal illness, to plan their funeral with them. This is one of the more rewarding parts of the celebrant role, and I have been privileged to meet a number of remarkable people over the years. As we become better at talking about death, and planning for it, this aspect of celebrancy is likely to increase in importance. Although the service is non-religious, we know that the mourners are likely to include some for whom religion is important. We make it clear from the outset that the ceremony will be inclusive, and we usually include a period of quiet reflection which can be used for silent prayer. One of the most rewarding parts of the job is when a devout believer comes up after the ceremony and tells me that although they are a regular churchgoer, and had been dreading the service, they were surprised to find that it was a respectful and uplifting experience. We spend a lot of time planning weddings; funerals deserve the same attention to detail, and while the FD will take on the practical arrangements, an experienced celebrant will ensure that the service delivers a dignified celebration of a life lived, tailored to the wishes of the deceased and his or her loved ones. Fill out this form to share your story and help start the conversation.